Barcelona at its most multifaceted and intense unfurls at night, the time for theatre, drinks with friends, music and dancing. 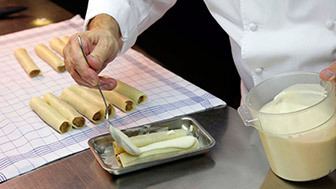 This is when the Catalan capital's most risqué, hidden-away and discrete spots open up, where the day lengthens and the nightlife bursts out: this is where the city at its most eclectic and select and where lovers of opera, grand settings, ground-breaking small-format theatre, cabaret, beer, wine, gin and tonic and exclusive cocktails, the old dance halls and the latest discos all come alive. This is Barcelona at its youngest, most vibrant and modern and the city at its most authentic and diverse during the night. Of course, whoever ventures out at night will find it hard not to come across the following inevitable message on the doors of bars and clubs: “Please respect the neighbours' peace and quiet”, an completely indispensable request and piece of advice in a city like Barcelona that has such a powerfully vibrant range of culture and entertainment to offer. There are bars of every size, renovated or old-fashioned, that magically lengthen the day with glasses of wine, beer or Martinis. 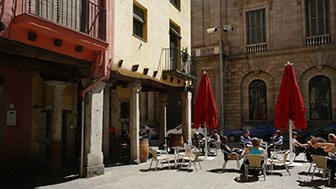 And cocktail lounges, full of character, where waiters wearing bow ties serve spirits, such as in the legendary Boadas, in the heart of the Raval. And Modernista establishments where time has stood still, such as Casa Almirall. And breath-taking terraces, whether at street-level or at the top of a sky-scraper, such as Mirablau or the spectacular Mediterrani balcony in the bar-restaurant inside the Catalan History Museum, ideal for enjoying the city's aromas, with drink in hand, at any time of the year. What's more, many hotels in Barcelona open their roof terraces to the public, offering fantastic views of the city. Night-time is also the best time for enjoying live music, in places such as Jamboree, Harlem Jazz Club and the Modernist Barts, and burning off those drinks to the rhythm of the music hand-picked by DJs in discos and clubs for all tastes, from Luz de Gas, to Sala Bikini and the legendary Apolo. And that's because Barcelona folk love the night and all it offers, always diverse, always intense. For the locals, the weekend starts on Thursday, but Barcelona's nightlife goes on throughout the week, packed with students and visitors. These are also ideal days for a little culture and discovering the more dramatic side of Barcelona, with its full and varied theatre programme. The best selection of night-life offers in the capital can be found in the magazine Time Out Barcelona. Here's a taste. The city's neighbourhoods hide away charming establishments, full of history, such as the Boadas cocktail lounge, where Joan Miró and Ernest Hemingway savoured their drinks, Bar Pastís, a former French-style cabaret club, and the Modernista and much-loved London Bar and El Paraigua. These are the places for happy aperitifs, a quick beer after work, and, at night, a place to enjoy musical rhythms. There are sophisticated ones on the roof-tops of many hotels, where the Barcelona skyline is a treat to behold. The rule, as always, is respect the local residents' right to peace and quiet. Barcelona offers live music practically every night, with jazz and flamenco tablaos performances and more modern venues that showcase the trendsetting music scene. Not to mention the many festivals and the stadiums and arenas playing host to big concerts. You've got endless options for getting down on the dance floor as well as every possible genre to move to: for lovers of rock, garage, funk, commercial music, salsa etc. There are clubs and discos all over, in the centre and outside. Barcelona is a city of theatre and spectacle, and there is something for every taste: from the most classical to the more risqué large and small format productions, musicals, kids' shows, commercial productions and alternative shows, from the spectacular to the more intimate. 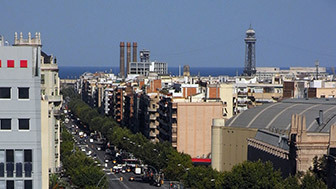 Today's El Born and La Ribera neighbourhoods are at the centre of new urban trends.